The Black River Safari Tour is located east of Negril, the small town of Black River to enjoy a cruise on the river of the same name. It's a drive along Jamaica's south shore, a region that has remained nearly untouched by tourism (although plans call for the Sandals chain to erect a new property aimed at families named Beaches in the near future). This tour takes travelers up the Black River, much of the water comes from the runoff from the peat bogs. The black sediment colors the bottom of the river, giving it the name. The water on the lower stretch is also brackish, about 15 percent salt water that comes in and mixes with the fresh water during high tide. This brackish water allows for the growth of a mangrove forest. The mangroves have roots that cascade from high branches and reach the water. The result is a curtain of thick roots, an almost impenetrable fence that divides the river from the marshy swampland that lies beyond the trees. The forest also creates an environment rich in plant, fish, animal and bird life. The waters here are home to snook and tarpon, some reaching as large as 200 pounds. Near the mangrove roots, spear fishermen, using a snorkel, mask and speargun, swim in the dark river to bring in the day's catch.The fish go into the canoe, hand-hewn and burned out in a generations-old technique. Other fishermen use wire traps to catch blue Marie crabs. Shrimp are caught using the shrimp trap, an African design dating back over 400 years. The bamboo trap, shaped like a large inverted bottle, holds coconut and oranges in he wide end. After two or three days in the river, the trap is checked and the shrimp fall out when the smaller end is twisted. In the St. Elizabeth parish, look for women on the side of the road selling bags of peppered shrimp. Highly salted and spiced, these small shrimp are a popular snack with locals and visitors. The waters are also dotted with bull rush, giant fern (one of 600 species found in this country) and pancake lilies. The captain also points out a tree with a 35 year old termite nest and trees where over 3000 cattle egrets nest nightly. 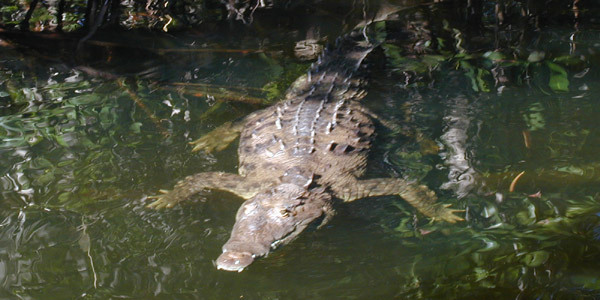 But the biggest attraction on the Black River are the crocodiles. One time hunted, these crocodiles are not protected but still remain wary. Loud talk (or even a spear fisherman at work) causes the crocodile to take refuge. These reptiles can live as long as 100 years, so long that some have become known by local residents. One 15 foot long specimen named Lester is seen nightly as he heads out to sea. The Black River is formed from three tributaries: the Y.S., Middlequarter, and Salt Spring. The safari tour takes visitors up the Salt Spring, once one of Jamaica's most important waterways for transporting rum and sugar cane.